Grace Goodrich Markham was born on June 5, 1905.1 She married William Stephen Vanderbilt on June 7, 1924 at Hartford, Hartford, Connecticut, United States .1 Grace Goodrich Markham died ?unknown. Marion Hudson was born circa 1875.1 She married John Butler Goodrich, son of Samuel Griswold Goodrich and Annie Williams Butler, on July 4, 1911.1 Marion Hudson died ?unknown. Marguerite Kew was born on May 25, 1880 at Waitsfield, Vermont, United States .1 She married Samuel Griswold Goodrich, son of Samuel Griswold Goodrich and Annie Williams Butler, on December 27, 1921 at Norwich, Vermont, United States .1 Marguerite Kew died ?unknown. Clyde Virginia Trippett was born in 1863 at Qunicy, Iowa .1 She married Edward Mauran Dunbar, son of Edward Ely Dunbar and Sophia Sterry Mauran, on July 17, 1883 at Prescott, Iowa .1 Clyde Virginia Trippett died ?unknown. James Lowell Linsley was born on November 26, 1880 at Woodbury, Connecticut, United States .1 He married Edith Moore Trowbridge on April 18, 1906 at Naugatuck, Connecticut, United States .1 James Lowell Linsley died ?unknown. Mary E. Smith was born in 1864 at Woodbury, Litchfield, Connecticut, United States .1 She married Dudleigh Smith, son of Nathaniel Smith and Emily Louisa Goodrich, on April 5, 1883 at Woodbury, Litchfield, Connecticut, United States .1 Mary E. Smith died ?unknown. Goodrich Truman Smith was born on December 25, 1883 at Woodbury, Litchfield, Connecticut, United States .1 He married Amparito Farrar on June 2, 1919 at New York, New York, New York, United States .1 Goodrich Truman Smith died ?unknown. Louise Lee Andrews was born circa 1870.1 She married Henry Bacon circa 1895.1 Louise Lee Andrews married Frederick Larnac Eldridge, son of Frederick Gideon Eldridge and Alice Lee Goodrich, on February 3, 1916. Louise Lee Andrews died ?unknown. Mary Judson was born circa 1870.1 She married Chauncey Eldridge, son of Frederick Gideon Eldridge and Alice Lee Goodrich, on November 9, 1901 at Philadelphia, Pennsylvania, United States .1 Mary Judson died ?unknown. Mabel Baylis was born circa 1870.1 She married Chauncey Eldridge, son of Frederick Gideon Eldridge and Alice Lee Goodrich, on April 18, 1914.1 Mabel Baylis died ?unknown. Jessie Harris Cushing was born circa 1885.1 She married Howard St. George Eldridge, son of Frederick Gideon Eldridge and Alice Lee Goodrich, on July 14, 1923 at Westboro, Massachusetts .1 Jessie Harris Cushing died ?unknown. Harriet Ropes was born on January 8, 1908 at Cambridge, Middlesex, Massachusetts, United States .1 She died ?unknown. 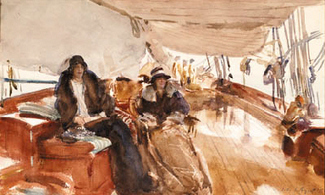 MARY & HENRIETTA SARGENT; PAINTING BY THEIR COUSIN JOHN SINGER SARGENT TITLED "CONSTELLATION, RAINY DAY ON THE YACHT"
[S482] New York Times April 17, 1953. Isabel Pelham Shaw was born circa 1875.1 She married Frederick Eldridge Lowell, son of Edward Jackson Lowell and Mary Wolcott Goodrich, on April 30, 1903 at Boston, Suffolk, Massachusetts, United States .1 Isabel Pelham Shaw died ?unknown. Marianna Lowell was born on May 28, 1904 at Boston, Massachusetts, United States .1 She died ?unknown. Alice Lowell was born on April 16, 1906 at Boston, Massachusetts, United States .1 She died ?unknown. Francis Cabot Lowell was born on August 6, 1909 at West Roxbury, Massachusetts, United States .1 He died ?unknown. Father* William Monypeny1 b. 1829, d. ? William Monypeny+2 b. circa 1895, d. ? [S569] Unknown author, "unknown short title," e-mail to unknown recipient.